I grew up on a farm and had and loved many dogs. My parents are still there and have a cute dog now who just showed up and decided to stay. They all have been lovable mutts except for one pure-bred beagle who was just as lovable as the rest. I love the Cat Who books and am looking forward to reading this this new series. I want a corgi so bad. >.< I go to pet stores and stare at them with longing. AND, I follow on Twitter and gave this contest a Tweet. I have an Alaskan Malamute that I adopted from a local rescue group. He had added so much fun and joy to my life and I'm so blessed to share a home with him. How about a christmas adventure/mystery for Chet. Alison and I love both dogs and christmas. Thank you for the giveaway. We have two mutts, both were from the pound. Best place to get a real friend! And three cats.. two hamsters... a squirrel.. three kids.. a full house. My daughter just got done reading a children's chapter book, I Jack, told from a dog's perspective. She kept reading me all of these funny quotes from the book. Please enter me! I'd love to have this and then pass it on to my daughter. I have the cutest little rat terrier - she talks to us! I'd love to read this. Chet sounds like a cool detective. My own dog, however, would fail horribly. He's more concerned about running away from danger, and he thinks everyone is evil. He'd rather stay inside where it's safe. Chet sounds a lot like our dog and this book sounds great:) Thanks! My two labs are like children to me. They truly brighten my life. My 3 yo wants a dog so bad but our current lease does not allow it. I have given him a stuffed dog to help ease the wanting and it has helped so far. This is a different perspective to write a book from. I don't think my yellow lab Scooter could help solve a mystery, unless it involved food. I love a good dog story.. We have a whole gaggle of rotties and I would not trade them for anything. I am both a mystery fan lover and a dog lover! I am the owner of 3 cats and a rabbit...but the grandmother to Toby, a malti-poo who has many sleepovers at our house! 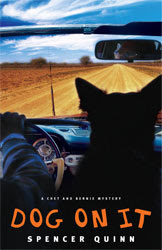 I would love to see a plot where Chet and his human investigate puppy mills! I love mystery novels but I must confess, the ones I usually read involve cats, as in "The Cat Who..." series. But I would love to read this book to try something new! My favorite dog growing up was named Abby--I rescued her from some neglectful neighbors and she was so small she slept in a strawberry crate for a long time! Because we rent right now, we can't have a dog. But one day I would love to own a pug-I think they are so adorable! We love to take our son to see the puppies at the pet store. My little grandson has his own big red dog (Lab) named Clifford. I would love to win this book. I have a 13 year old black lab who still acts like he is a puppy, he is the best dog ever! Thanks for the giveaway, this sounds like a fun book! My dog Tippy was a cute little terrior. I had him when I was a little girl. He would always chase cars since we lived out in the country on a gravel road. He got clipped 3 times by cars but it didn't stop him. He'd lay around for a few days and then go right back out there. He is gone now but I will always remember him. Heaven must be the land of dogs, because what could be better??! Our dog is older and doesn't always get up to greet me when I get home, but I hear him...his tail wagging and hitting the floor...thumping away so hard and crazy...reminds me of the (giveaway) paragraph, with Chet's tail wagging and causing a breeze!! I've got two dogs! One is a little rat terrior (however you spell that) and not really sure what the other is! I'd love to win this book. I have a history of memorable dog. Toby the Cocker, Sadie the Irish Setter, Bobby the teripoo, Inka and Tara the black labs.All at different times in my life and all now on the otherside of the Rainbow Bridge. I will always have a dog. Dogs are my favorite animals. This looks like a great book. I used to have 2 dogs, but they are gone now and I'm afraid of the emotional pain of having a new dog. But at least I can read about them! I just subscribed in Google Reader! I have four Chihuahuas and they are the loves of my life. Please include me in your giveaway. I think that Chet needs to head to sea on some adventure maybe getting lost at see and landing on a very nice inhabited island where he meets new and exciting people with a different culture. Anyway please include me in this giveaway. Dogs? What can I say about dogs? Well we now have 2 dogs, we recently had to have our beloved black lab named Blackie put to sleep due to the fact that he had prostate cancer, he was 12 years old and the best dog ever. The dogs we have now are Shadow, a lab/newfoundland mix and Sophie, a Cocker spaniel. Our daughter lives with ua also and she has a cocker spaniel named Motely. I guess you could say we love dogs. We have three rescued dogs and two rescued cats. I have a pet hair issue! I'm thinking that Chet should continue his PI Career with a stint of investigating unfaithful spouses -- he should try digging up some dirt on them. My greyhound, Story, would make a terrible sleuth. She has no suspicions of anyone's integrity.